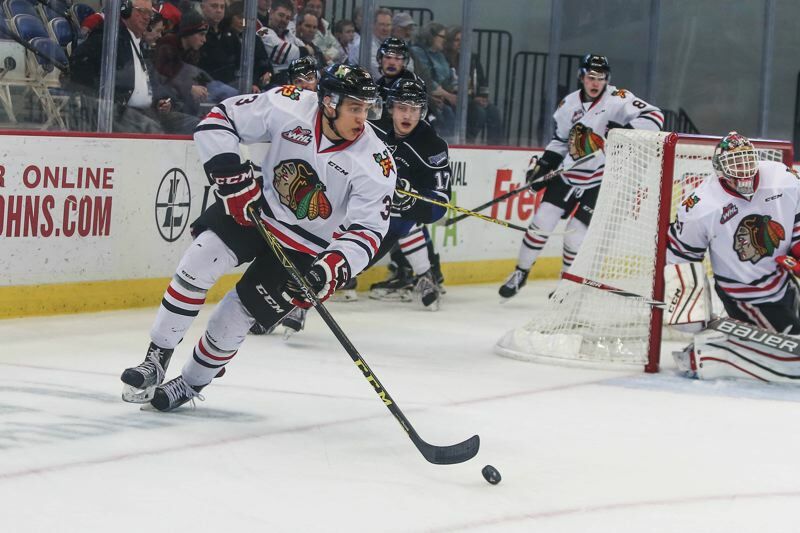 Caleb Jones did not get to experience a Western Hockey League championship like his older brother, Seth, did during his time with the Portland Winterhawks. But Caleb, who expects to begin his professional hockey career next season, credits his two years in Portland for his promising future. "I did a lot of growing up here," Jones said after the Winterhawks were eliminated from the 2017 playoffs by Kelowna. "This place is great — the city, the fans, the coaches." Jones was drafted by the Edmonton Oilers in 2015, before he played for the Winterhawks but after two seasons in the U.S. Hockey League with the USA Hockey under-17 and under-18 teams. Once he was drafted by the Oilers, Portland provided the place to prepare Jones for life in the pros. "I had two different coaches (Jamie Kompon and Mike Johnston). They were both unbelievable. I learned a lot as a person and a hockey player. They're a big reason I was able to be signed by Edmonton and hopefully play in the NHL soon," he says. Jones, 6-1 and 190 pounds, signed an entry-level contact with the Oilers last spring. He likely will play next season with Edmonton's American Hockey League team — typical for a 20-year-old who was a fourth-round (117th overall) NHL pick. From Arlington, Texas, Jones got his chance to follow his brother to Portland when he was selected by Johnston in the third round of the 2012 WHL bantam draft. By the time he arrived in Portland as an 18-year-old for the 2015-16 season, Johnston was in Pittsburgh coaching the Penguins. Then Johnston, who likes offensive-minded defensemen who can skate, returned to Portland. "His style fits me perfectly. I think that's why he took me in 2012," Jones said. "Obviously, Jamie was great, too. But Mike, his system, the way he coaches, is made for me. He helped develop me a lot this year." Part of that development was being a leader for a young team. "I've never really had that big leadership role, and I took on that this year and that was something I was able to develop, and a reason why I wanted to be in Portland this year," Jones said. "I knew I could take on a leadership role and be a key player for the team." Johnston said Jones helped the Hawks win this season and made a positive impression on young teammates — including some who were only around for training camp. "He had a huge impact," Johnston said. "He was one of the best defensemen in the league, I thought, if not the best. His game has really matured over the years. He's going to be a good professional player." Jones renewed his commitment to Portland after helping Team USA to a World Juniors championship in early January. He knew other WHL teams were asking about trading for him, but told Johnston he wanted to stay with the Winterhawks. "I told (Johnston) I thought we had a really good team, and we could do some really good things this year," Jones said. "We kept everything intact, and it paid off. We got 40 wins and we beat the B.C. Division champ (Prince George in the playoffs). So it was definitely a good year." As a key to the Winterhawks' transition game, Jones was a focus of physical play from both Prince George and Kelowna. "I like challenges like that," he said. "I'm a competitive guy." Jones finished his WHL career with 19 goals and 98 assists in 135 regular-season games. He had two goals and 10 assists in 15 playoff games. On Dec. 27, 2015, Jones converted an overtime penalty shot to beat Tri-City, with more than 10,000 fans at Moda Center. "The crowd was so loud, and that was probably one of the best goals I've scored," he said. "It was a great scene and a great memory for me. That and winning that playoff series (this season)."